“The main reason for choosing this gym was the child care,” Rubio said. Child care is a wonderful amenity for a CrossFit affiliate, but it brings with it a host of responsibilities for the affiliate owner. Affiliates such as Wasatch CrossFit in Utah, CrossFit West Sacramento in California and CrossFit Wilmington have engineered creative solutions that take the onus off the affiliate owner but still allow the business to offer a service that separates it from the competition. 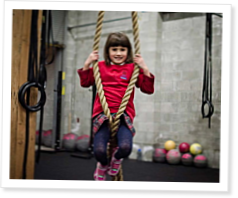 Some affiliates, such as CrossFit Eminence in Thornton, Colorado, don’t offer child care but instead provide a kids’ area, typically within view of the workout space. That, too, brings challenges. It’s been said that children are like tiny drunk adults, and an unsupervised group can wreak havoc on the most kid-friendly space. Bringing children into an affiliate requires a delicate balance between satisfying the parents and making sure the space doesn’t turn into a crumb-covered Gymboree. Three cups of coffee, six hours of coaching, four hours on the computer and one-life changing encounter: a day in the life of affiliate owner Mark Lin.